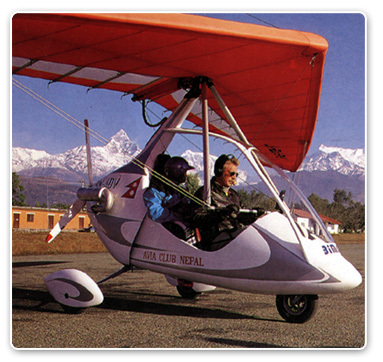 Ultra light aircraft was introduced in Nepal in 1996, and the operator has been offering sightseeing tours in the Pokhara Valley. The choice of the Pokhara for ultra-light aircraft is appropriate chiefly because of the proximity of the mountains, and the scenic lakes. For those who wish they could fly like birds, this flight is a must. Leave your woes behind on earth, soar to heights, bathe in the clouds, reach out foe the mountains and kiss the azure sky. It might be lonely at the top, but the spectacular view from high up there certainly makes up fie everything. The company operates flights from the Pokhara airport beginning September through June. The flights take place from sunrise to 11 a.m. and from 3 p.m. to sunset every day during these months. Three different routes are taken. fly for fun: Duration 15 minutes. The aircraft flies over the Pokhara city, Phewa lake Sarangkot hill at the speed of 50-90 km/hr. the maximum altitude attained is 5,000 feet. This flight is designed for the fun-lover. Touch the Fish Tail: Not quit, but still this flight takes you as close to the fish tail as is possible without compromising the safety. Duration 30 minutes. The speed is 90 km/hr. Mountain range Sky Trek: Duration 1 hr. this flights covers the whole of the Annapurna range at the speed of 90-130 km/hr. the altitude attained is 12,000 feet, high above the clouds. The service has two ultra-light aircraft of the model by “Biman-1”company ltd, the delta wing aircraft fitted with “ROTAX 582” engine and weighing 170 kg, has an operational speed of 50km/hr to 130km/hr. the use of aviation-grade aluminum alloys, Dacron, parachute Recovery System 9 which will help the aircraft to land safely in case of emergency), world-class piston and satellite- assisted navigation GPS, has enhanced safely while keeping the weight to minimum. Ultra-lights can take off and land in a field or a dirt road, and in areas where other plane fear to tread. The aircraft seats two, passenger and the pilot, it can fly for hours.